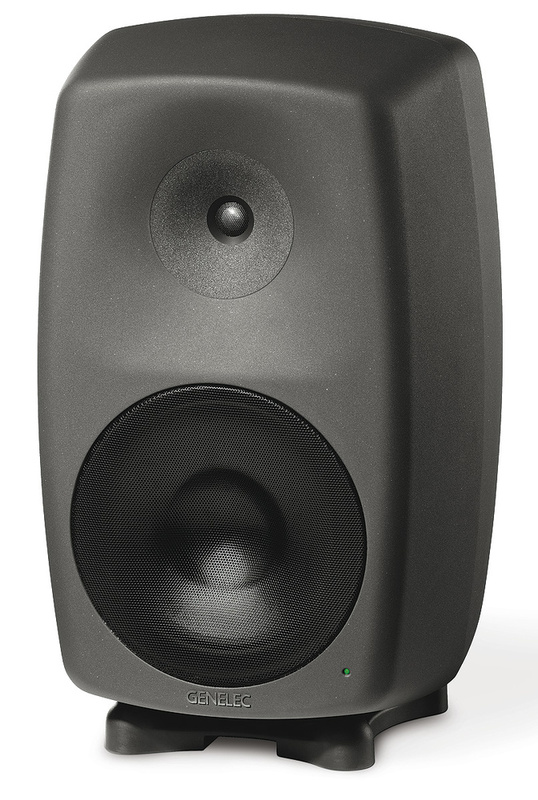 They may have the familiar Genelec appearance and family sound, but these big beasts bring some new ideas to the table. The new Genelec 8260A active reference monitors look much like all the other 8000‑series Genelec monitors, encased in the same style of slightly dumpy and rounded grey die‑cast aluminium cabinet, and with the same adjustable Iso‑Pod rubber isolation feet at the base. It's only when the boxes arrive — and especially when you try to take the 8260s out of those boxes — that you realise quite what a beast of a speaker this is! The picture here gives no real sense of scale, but these monitors measure 357 x 593 x 347mm (WxHxD) or roughly 14 x 23.5 x 13.5 inches, and they weigh 27.5kg each (60.5lbs) — so we're talking substantial midfields here. Thankfully, the 8260As come fitted with a sturdy fabric carrying-handle on the rear panel, which makes life considerably easier than it might otherwise have been! The rear panel also includes integrated support points for various floor and wall stand options. 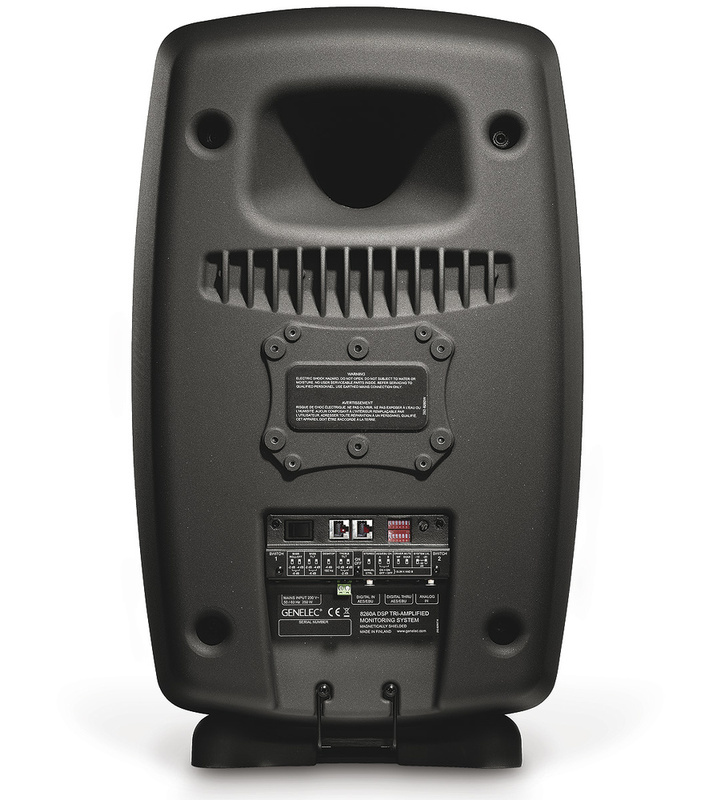 Although this 8260A looks like a two-way it is, in fact, a three-way design: the mid-range driver and tweeter are mounted coaxially above a conventional 255mm (10‑inch) bass driver. Genelec like their acronyms, and the one they've coined for this new coaxial driver design is 'MDC', or 'Minimum Diffraction Coaxial' driver technology. Not surprisingly, the Finnish manufacturers claim amongst its benefits more accurate imaging (because of the coincident mid‑frequency/high‑frequency point source) and improved sound quality — both on and off‑axis. The 8260A is also the first model in which Genelec have combined a coaxial driver with their waveguide technology (DCW), which helps to manage the way in which the three drivers integrate over their full operating bandwidth. There's nothing new in the idea of coaxially mounted drivers, of course. The first incarnations date back to 1941 and the best‑known version — Tannoy's dual‑concentric design — appeared in 1946. The benefits of point sources when it comes to stereo imaging are well known, too. However, Genelec claim that their breakthrough is in using a tweeter/mid-range coaxial driver arrangement, rather than the more conventional LF/tweeter design. They claim that the latter arrangement suffers an uneven frequency response, as the movement of air from the woofer's cone causes distortion in the output of the tweeter. Using the tweeter/mid-range driver combination instead, there's less air movement from the mid-range driver, and thus less treble‑response distortion. The tweeter is a fairly normal 19mm (0.75‑inch) aluminium dome, and behind that is a 120mm (five‑inch) laminate cone mid-range driver, the cone of which also forms part of the DCW waveguide. The crossovers are at 490Hz and 2.6kHz, and the overall frequency response is quoted as 29Hz to 21kHz (±1dB). Maximum SPL is stated as 120dB (at 1 metre) and self-noise is a very quiet 5dB SPL. Three amplifiers deliver 150 (LF), 120 (MF) and 120 (HF) Watts, and consume 330VA at full power and 26VA on idle. The remarkably sturdy and vibration‑free aluminium cabinet is a reflex ported design, venting at the top of the rear panel. Its softly rounded shape goes by the name of 'Minimum Diffraction Enclosure', the intention being to prevent edge diffractions and greatly benefit the stereo imaging. Like so many of Genelec's current range of speakers, the 8260A incorporates a DSP module, which looks after the crossover filters and driver equalisation and position alignment, as well as room‑response alignment and calibration, and distance‑compensating delays. Although the system can run in a default, stand-alone mode, the real benefits come when the Genelec Loudspeaker Manager (GLM — yet another acronym!) software is used to configure and manage all the DSP functions. Not only does this facilitate use with other 8200-series DSP monitors and 7200-series subwoofers in large multi-channel arrays, it also allows automatic room calibration via Genelec's 'AutoCal' system‑alignment method. The back of the 8260As is dominated by the rear port, integral moulded heatsink fins, and the rear support-bracket fixing points, but below all these is the interesting stuff! In a recessed, downward‑facing panel are three XLRs — one for the analogue input, both male and female connectors for the AES3 digital input, and a loop through. There is also the usual IEC mains inlet (fixed voltage), and a pair of screw terminals for a 12V remote switch‑on facility (this is a common requirement in high‑end hi-fi installations). Above this connection panel is a strip of printed information explaining the functions of the two seven‑way DIP switches that reside in the panel above, along with a rotary sensitivity control (scaled from 0 to‑12dB), a pair of RJ45 connectors for use with the Loudspeaker Manager software, and the mains on/off switch. The first of the two DIP switches is a throwback to Genelec monitors of old, providing manual control of the monitor equalisation. Two switches provide four stages of bass roll‑off (0, ‑2, ‑4 and ‑6dB), bass tilt (same four options), desktop correction (‑4dB at 160Hz), and treble tilt (+2, 0, ‑2 and ‑4dB). The first option on the second set of DIP switches allows the unit to be used with the manual settings from the first bank of switches, or to employ the DSP EQ settings stored internally (including room correction, if that has been programmed). The next pair of switches determine which channel to use from the AES3 (stereo) input, and the following pair allow the woofer and mid-range drivers to be muted (presumably for test purposes). The last pair sets the system level with four options of 0, ‑10, ‑20 and ‑30dB. 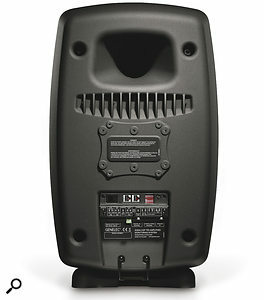 I mounted the 8260As on a pair of supplied Genelec pole stands, the Iso‑Pod feet slipping neatly and securely over studs on the stands' top plates. These stands were slightly too high for my application, even at their lowest setting, but the Iso‑Pod brackets allowed the speakers to be tilted down sufficiently to aim the tweeters at my ears when seated. Under normal circumstances, I'd have preferred to use a more rigid stand, as the supplied ones suffered a little more wobble than I like — but they did the job adequately. Although the speakers have both analogue and digital inputs, I used the analogue connections fed from a Grace m902 preamp/controller, with a variety of digital and analogue replay sources to listen to. Initial listening was with the speakers in their default flat mode, and then subsequently after a single‑point AutoCal room‑alignment process. I'd hazard a guess that most people have heard some form of Genelec speaker at some time or other, and Genelec have always been very good at maintaining a consistent sound presentation — slightly forward, possibly, but detailed and neutral overall. It's a sound presentation with which a lot of engineers are very familiar indeed. The 8260As have that same general character, and it's clear from the off that they're very much a part of the Genelec family. However, it's also immediately obvious that these are a step up from all the similarly styled breed of Genelecs. There is significantly more detail through the mid-range, more clarity, less veiling, and a generally more open and revealing character. The second thing I noticed was the absolute rock solidity of the phantom image. Few speakers achieve this level of imaging resolution and, on well recorded material, the stereo image was expansive and detailed, with a very good impression of depth and space. The third thing that I noticed was the bass extension — these are fairly big speakers but not exactly huge. My reference PMC IB1s are substantially larger, and yet the 8260As were delivering a very credible deep bass performance, with excellent delineation between kick drums, floor toms and bass guitars. The 8260A is a very impressive monitor speaker, worthy of its not-insubstantial price. Detail, resolution, transparency, transient precision, stereo imaging and bass clarity are all major strengths. DSP room‑correction will never replace proper acoustic design, but it can help with that final level of auditory polish and precision, and Genelec's GLM AutoCal system works well. If you have a relatively large room, need some new midfield monitors, and aren't short of pennies, the 8260As are a must for your shortlist. Three-way designs usually deliver significantly better performance than two-way designs. Possible alternatives include PMC's IB2A, the Adam S5A, the ATC SCM100A, the Barefoot Sound MM27, and Geithain's RL901K. The Loudspeaker Manager software is very intuitive and simple to use, although there is also an advanced mode if you want to get really tweaky with it! With the software loaded on the computer, the two speakers are connected to each other with standard Cat 5 network cables, and then one speaker is linked to a small interface box that talks to the computer via USB. The measurement microphone also connects to this interface box. Plugging the network cables into a speaker causes the speaker to mute, which can be perplexing if you're not expecting it! With everything hooked up, the software takes you through a process of identifying each speaker, and then generates a sweep test chirp, initially to set levels, and then to analyse the in‑room acoustics. After a quick chirp from each speaker, the computer program displays a frequency-response plot for each speaker, showing the original measured response, the corrective EQ it wants to apply, and the intended result. In my room, it easily identified the modest peaks I have at 30Hz and 90Hz, and the deep notch at 60Hz (caused in part by rear-wall reflections), and the corrective EQ it wanted to apply was sensible and effective. Consistent with the Genelec 'house sound'. Superb mid-range resolution and detail. Rock‑solid and expansive stereo images. Serious bass performance with good timing. Needs substantial stands... and a substantial bank balance! The 8360A is a unique three‑way Genelec design using a coaxial mid-range driver and tweeter that also forms part of the DCW waveguide. DSP crossover and equalisation options, including room correction, make this an easy speaker to install. £7460 per pair including VAT. Genelec +1 508 652 0900.